Watercolor, gouache, charcoal and pencil on paper. In 1909 and 1910, Egon Schiele collaborated with the Wiener Werkstätte, a cooperative established in Vienna in 1903 to promote the decorative arts. One of the most important commissions was a stained-glass window for the Palais Stoclet in Brussels, designed by the architect Josef Hoffmann, for which he made an oil sketch of the portrait of Poldi Lodzinski. Although the window was never executed, there is no doubt that the artist put much effort into this work, in view of the numerous preparatory studies, including the present watercolour in the Museo Thyssen-Bornemisza. The simplified geometric design of the figure and the white halo behind the young woman’s head may be explained by the fact that it was designed to be transferred to glass. The model Poldi Lodzinsky, the daughter of a bus driver of Krumau, the birthplace of the painter’s mother, poses sitting with her hands on her lap. Her position and the anxious facial expression recall Puberty by Edvard Munch, an artist Schiele deeply admired. 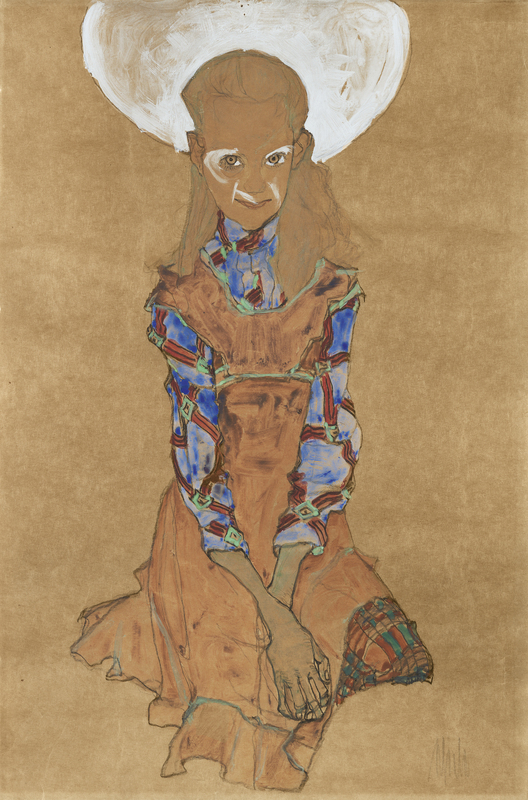 The painting is notable for the delicate handling of the patterned fabric of the dress; indeed, the print is characteristic of the Jugendstil, a fact which links Schiele to the work of his master Gustav Klimt.